Dè T’a Hoti Ts’eeda: ‘We Live Securely by the Land’ was an international exhibition that presented selected items from the National Museums of Scotland (NMS) Dene collection to a Canadian audience. The National Museums of Scotland (NMS), the Tłı̨chǫ Government, the Prince of Wales Northern Heritage Centre (PWNHC), and the Visual Research Centre at the University of Dundee (VRC/UD) collaborated in the development of this exhibition. It focused on Dogrib heritage items, but also included key pieces representative of other NWT Dene cultures. 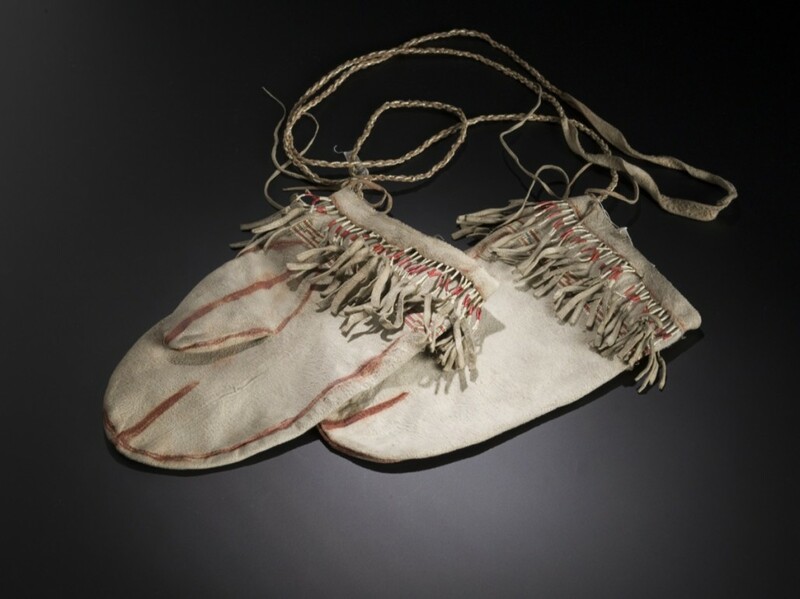 The National Museums of Scotland collection is the oldest and most extensive collection of 19th century Dene artifacts in the world today. 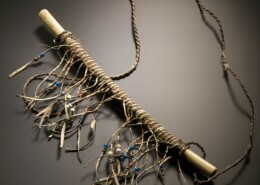 Assembled during a time of momentous change for the Dene, it includes items of great visual appeal and ethnographic interest, and provides unique perspectives on Dene technology and art during a critical period of their history. The exhibition provided a rare opportunity for Canadian audiences to view a selection of the most important objects in the collection. 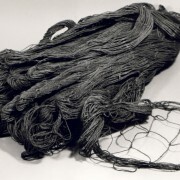 This web archive presents materials assembled and published during the exhibition, including the companion catalogue, sample gallery of objects from the collection, background on the genesis of this project, and ancillary information about the historic connection between Scotland and Denendeh. A fuller account of the history of the collection and of selected artefacts can be found in the catalogue The Athapaskans: Strangers of the North, National Museum of Man, Ottawa, 1974. Idiens, D. 1979. A catalogue of Northern Athapaskan Indian Artefacts in the collection of the Royal Scottish Museum, Edinburgh, Royal Scottish Museum Information Series, Art and Archaeology 3, March 1979. 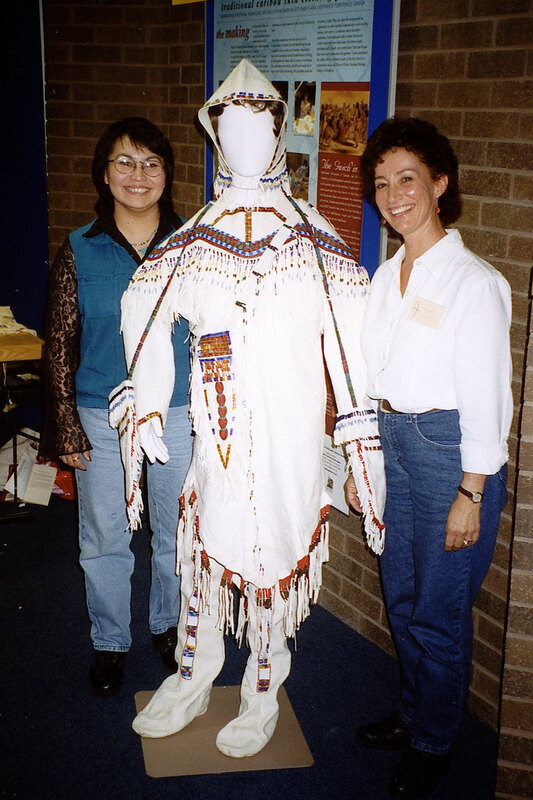 In the 1990s, staff from the Prince of Wales Northern Heritage Centre (PWNHC) undertook a number of collaborative projects with agencies of the Dogrib and Gwich’in Nations designed to examine in detail significant objects from the material culture of these societies. Under the rubric of knowledge repatriation, these projects sought to inspire the reacquisition of lost skills and techniques and provide northern communities with an opportunity to explore and celebrate their heritage. 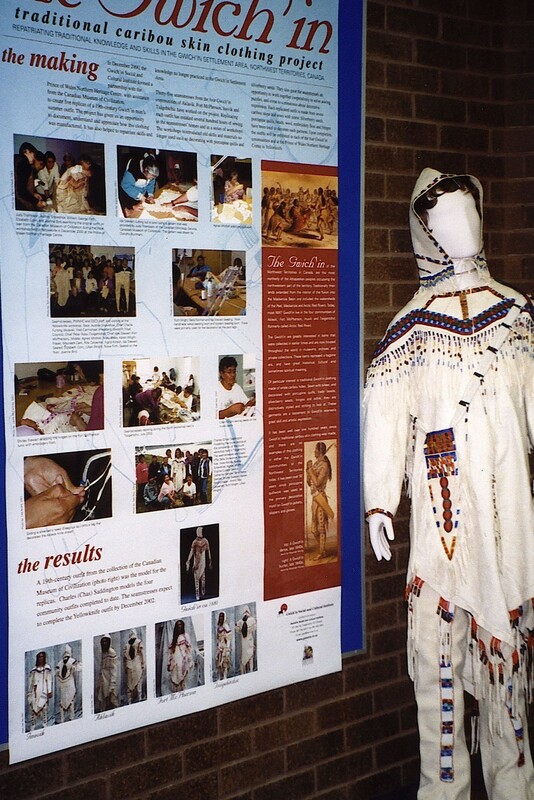 These projects garnered attention both at home and abroad and led to an invitation from David Anderson, professor of Anthropology at the University of Aberdeen, Scotland to attend the Ninth International Conference on Hunting and Gathering Societies (CHAGS) in September 2002. First convened in 1966 and entitled “Man the Hunter,” the conference assembled for the first time contemporary ethnographic and archaeological research relevant to hunting and gathering societies. PWNHC’s presentations focused on two of our recent collaborative projects: the Dogrib caribou-skin lodge and the Gwich’in clothing projects. Presenting these projects at a prestigious international conference allowed the PWNHC and its community partners to promote NWT heritage and provided anthropologists, archaeologists, and Indigenous People from many different countries an opportunity to learn firsthand the efforts being made in the NWT to preserve material culture and traditions. 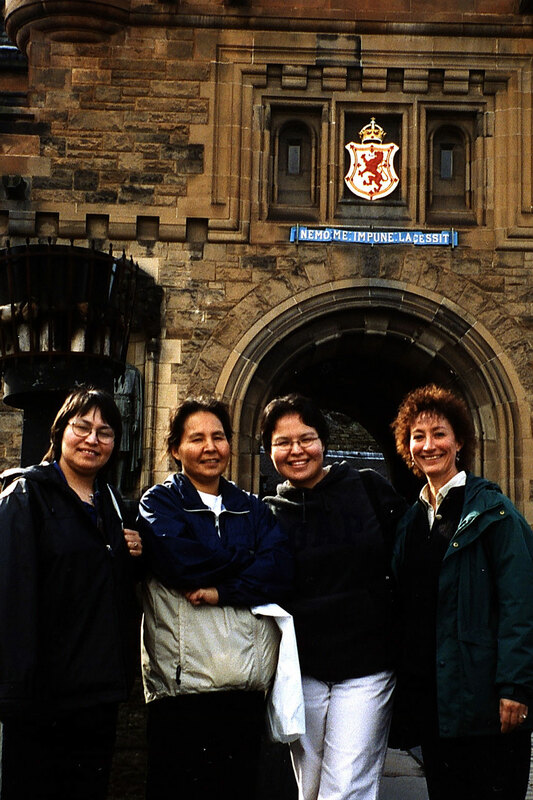 Rosa Mantla, Principal of the Elizabeth Mackenzie Elementary School in Rae, Ingrid Kritsch, Research Director for the Gwich’in Social and Cultural Institute (GSCI), Karen Wright-Fraser, seamstress and Yellowknife-based entrepreneur, representing GSCI, and Tom Andrews, Territorial Archaeologist with the PWNHC travelled to Scotland to present on behalf of these projects. Following the presentations, the caribou-skin lodge was loaned to Marischal Museum for a ten day exhibition. On September 19, a group of grade 5 children visited the exhibit. Following their visit, the students prepared an album of drawings and letters, which they forwarded to the children of Elizabeth Mackenzie School in Rae. In addition to these experiences, our delegation took the opportunity to study the 19th century Athapaskan ethnographic objects held in the collection of the Royal Museum of Scotland (RMS) in Edinburgh. This initial exchange eventually culminated in a working visit by our museum conservator Rosalie Scott to Scotland, and the international exhibition previewed here. 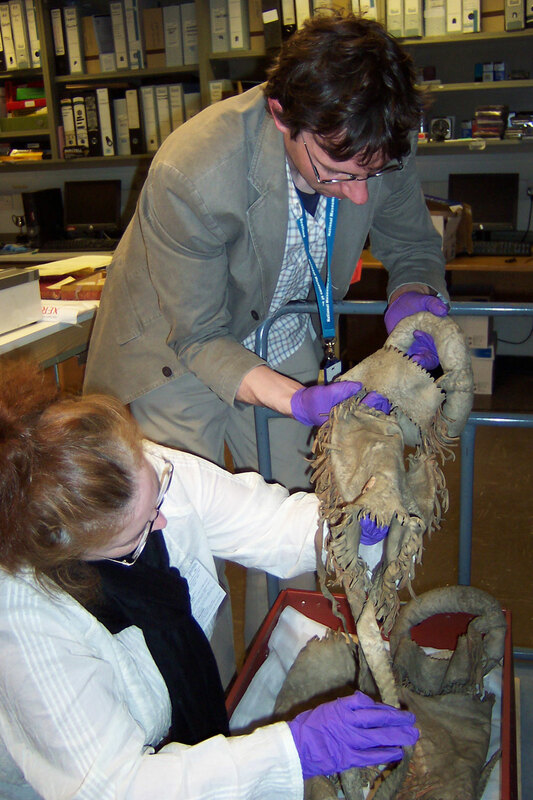 Conservator Rosalie Scott examining, preparing, and packing items in Scotland. Why are Northern Athapaskan artifacts in Scotland? The Northern Athapaskan collection is part of the collections of the National Museums of Scotland and are housed in the Royal Museum (formerly the Royal Scottish Museum) in Edinburgh, Scotland. The Royal Museum was founded in 1854 under the title of the Industrial Museum of Scotland, inspired by the widespread public interest of the period in the industrial achievements of the 19th century which gave rise to a number of major European museums. The first director of the Industrial Museum was Professor George Wilson (1818-1859), who also held the chair in Technology at the University of Edinburgh. He laid the foundations of collections which were intended to show the industries of the world to Scotland by drawing on sources at home and abroad. Wilson was a scientist, and he approached the task of filling his museum in a systematic and purposeful manner, issuing a collecting list to potential donors which gave general guidance on the requirements of the museum. 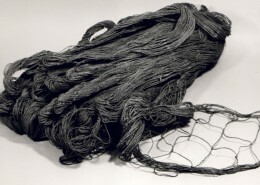 The acquisition of the Northern Athapaskan collection was part of the Museum’s (then called the Industrial Museum) search for material to illustrate products and manufacturing processes. Through the Director, George Wilson’s brother Daniel, who was Professor of History and English Literature at the University of Toronto, the museum was able to approach Sir George Simpson, Overseas Governor of the Hudson’s Bay Company, and ask for his assistance. At Simpson’s urging, clerks, traders and factors of the Mackenzie District soon began sending objects to the new museum. Many of the staff of the Hudson’s Bay Company, factors, traders and clerks stationed in forts and trading posts in the far north of Canada, were Scots or had links with Scotland. Their response to Wilson’s request was patriotically generous, and for almost five years, between 1858 and 1862, consignments of Northern Athapaskan and Inuit artefacts were shipped to the museum, usually without charge. The objects were listed by the collectors, who gave their cultural origin and function. The Hudson’s Bay Company men chiefly involved were George Barnston at Norway House, James Hargrave at York Factory, Robert Campbell at Fort Chipewyan, and Bernard Ross at Fort Simpson. The greatest contribution was made by Ross, whose interest led him to send written accounts of Indian crafts, such as quillworking. The number of ‘series’ i.e. 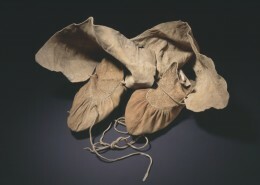 groups of one type of article, such as moccasins, showing the process of manufacture, are nearly all due to his intelligent response to the Museum’s requirements. Bernard Rogan Ross (1827-1874) was chief trader for the HBC in the Mackenzie River District from 1858 to 1862 (Bowsfield, 1972). Ross took particular interest in the natural sciences and studied geology, flora, fauna and culture of the Canadian Arctic and Subarctic (Lindsay 1987). An Ulster-Scot born and educated in Londonderry, Ross was first posted by the HBC to Norway House in 1843 and he quickly rose through the ranks of the Company. In 1856 he was appointed Chief Trader and, from 1858 to 1862, assigned to Fort Simpson in charge of the Mackenzie District. Ross retired in 1871. During his tenure as Chief Trader at Fort Simpson Ross made valuable natural history collections. Ross’s Goose (Chen rossii) was named in his honour. Although better known for his contributions to natural history than to fur trading, Ross became a founding fellow of the Anthropological Society in 1863, and a fellow of the Royal Geographical Society in 1864 in addition to several other learned societies. Lindsay, D. 1987 The Hudson’s Bay Company-Smithsonian Connection and Fur Trade Intellectual Life: Bernard Rogan Ross, A Case Study. In, B.G. Trigger et al (eds) Le Castor Fait Tout: Selected Papers of the Fifth North America Fur Trade Conference, 1985. Montreal: Lake St Louis Historical Society, pp. 587-617. Click on the thumbnails to view more information about the objects. 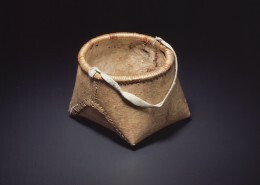 Although this hat is made mostly with trade items, like the coloured wool cloth and white beads, its shape is similar to the traditional Slavey hide covered smoking cap. Claws or feathers were often worn as ornaments or attached to clothing. In some regions, items from physically and spiritly powerful animals, such as these grizzly bear claws, were highly valued. 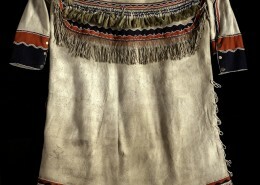 The striking white caribou skin, the broad fringed chest band of porcupine quills, the tapered shirttails, and the moccasin-pants are characteristic of early Gwich’in clothing. 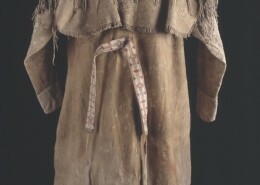 Quill wrapped fringes brighten the mittens and knife sheath while the shirt fringes are decorated with silverberry seeds and black glass beads. This outfit was probably reserved for important social or ceremonial occasions. This dress is a pleasing blend of European and traditional materials and styles. 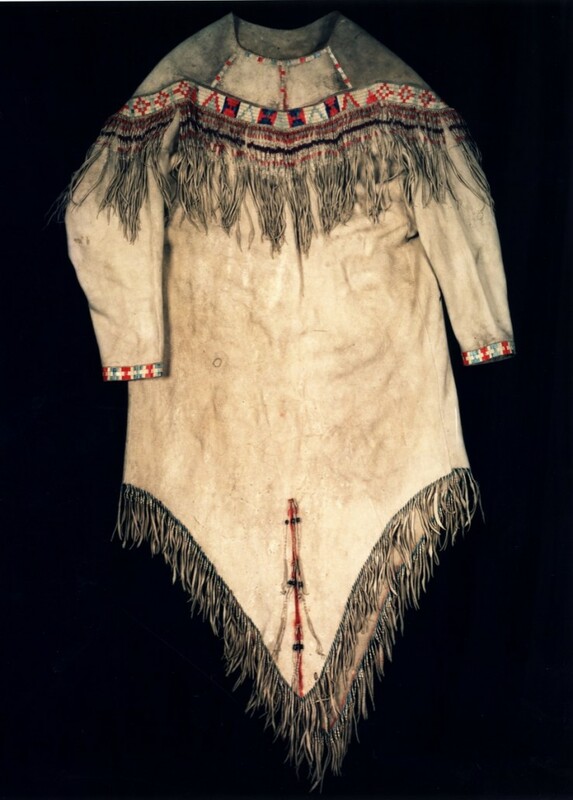 The dress is made from moose hide, sewn with sinew, trimmed with bright wool cloth and ornamented with beads and brass buttons. Red and white porcupine quills decorate the skin fringes. Clothing for a celebration! 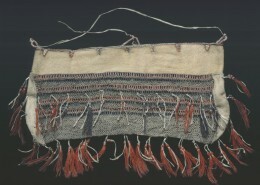 A fringe like this would be attached to the bottom edge of the back-cape on a woman’s dress. 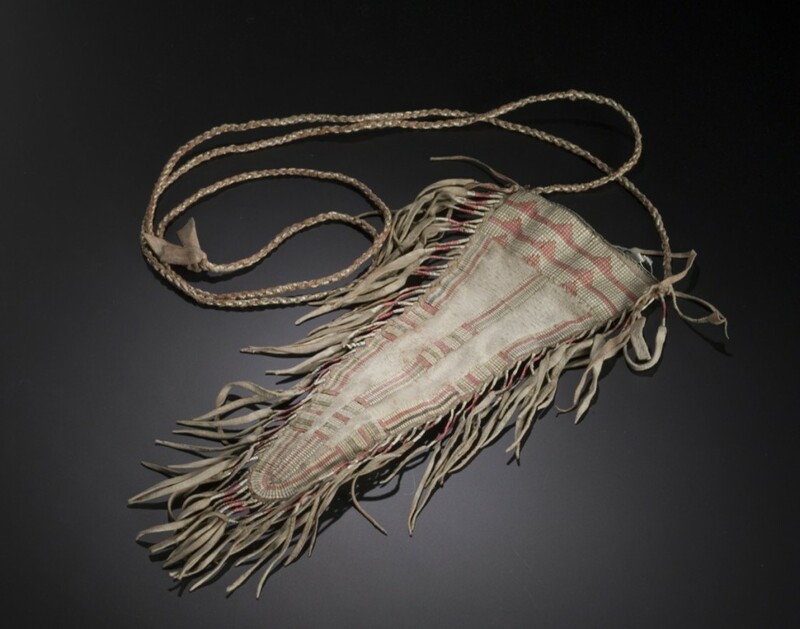 Tanned caribou skin was cut into slender thongs that were then intricately wrapped in alternate pairs with dyed porcupine quills to give a netted effect. 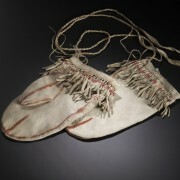 Winter moccasins were made larger to allow room for warm liners of furred rabbit or caribou skin. 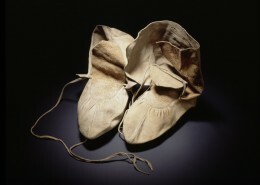 Thicker moose hide was used for the bottoms and caribou skin was used for wrap-around ankle flaps. 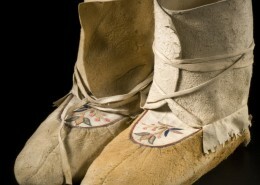 Pointed moccasins slowly disappeared from use after the 1930’s. 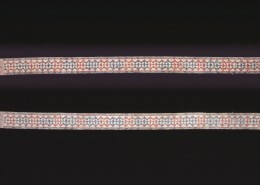 The tongues of this pair are embroidered with a floral design in silk thread. 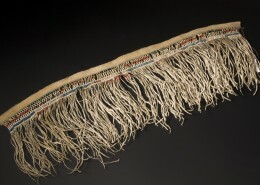 Band of red, white, blue and yellow loom-woven porcupine quills coloured with European aniline dyes and worked with sinew. Not yet attached to a tanned caribou skin band, so the cut ends of the quills are visible on the reverse side. Dimensions: 655 x 45 mm. Given by C. Ross, Fort Simpson, 1862. 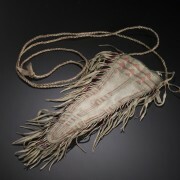 Band of loom-woven red and white porcupine quills mounted on tanned caribou skin. 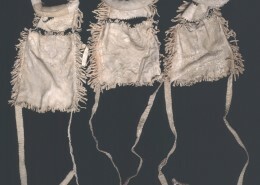 Stitched to dress at waist centre-back, and tying at front with thongs. Dimensions: 1370 x 37 mm. Given by B.R. Ross, Fort Simpson, 1860. Tanned caribou skin of two-piece form with added ankle flaps and thong ties. Sewn with sinew. Part of a set including dress and leggings. Dimensions: 215 x 120 mm. Provenance: Dogrib, Fort Rae, Great Slave Lake. Given by B.R. Ross, Fort Simpson, 1859. 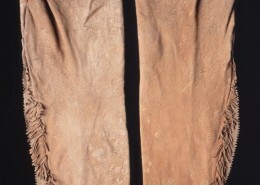 Tanned caribou skin with thong fringes at the seams. 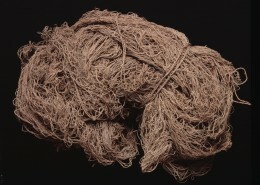 Sewn with sinew. 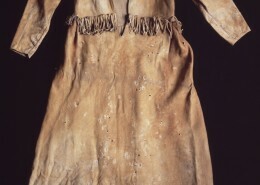 Part of a set including dress and moccasins. Dimensions: 590 x 234 mm. Tanned caribou skin tailored in European style with gathered skirt attached to high-waisted front-opening bodice, and set-in sleeves gathered at the shoulders. 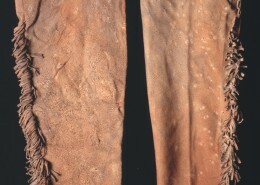 Thong fringes at the waist and lower part of skirt. Sewn with sinew. Part of a set including leggings and moccasins. Dimensions: 1220 x 541 mm. Tanned moose skin of two-piece form with added ankle flaps and drawstring thongs. Sewn with sinew. Part of a set including shirt and leggings. Dimensions: 225 x 101 mm. 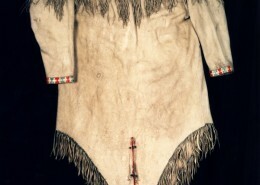 Tanned caribou skin with thong fringes at the seams. Sewn with sinew. Part of a set including shirt and moccasins. 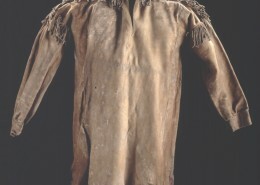 Tanned caribou skin with upright collar, and set-in sleeves gathered into cuffs. 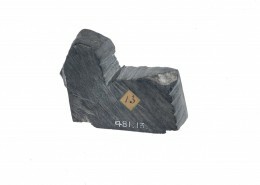 The lower edge is serrated and there is a slit at each side. Thong fringes at the shoulder and armhole seams and below the collar. Sewn with sinew. Part of a set including leggings and moccasins. 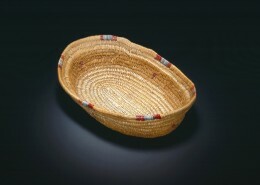 Shallow oval vessel of woven split spruce roots, decorated with red and blue dyed porcupine quills. Dimensions: 230 x 165 mm. Given by B.R. Ross, Fort Simpson, 1862. Cut and folded birchbark stitched with blue and white quills. The rim reinforced by a bent stick lashed with split spruce roots and red, blue and white dyed porcupine quills. Thong carrying strap. Cut and folded birchbark stitched with spruce roots and red, blue, and white dyed porcupine quills. Dimensions: 175 x 140 mm. Birchbark, stitched with spruce roots and brown and white porcupine quills. The rim reinforced with a bent twig lashed with spruce root and brown porcupine quills. Thong strap attached. Dimensions: 95 x 85 mm. 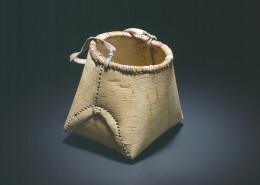 Shallow vessel of cut and folded birchbark with a square base. Stitched with split spruce roots; the rim wrapped with spruce roots and orange goose quills. Dimensions: 180 x 70 mm. 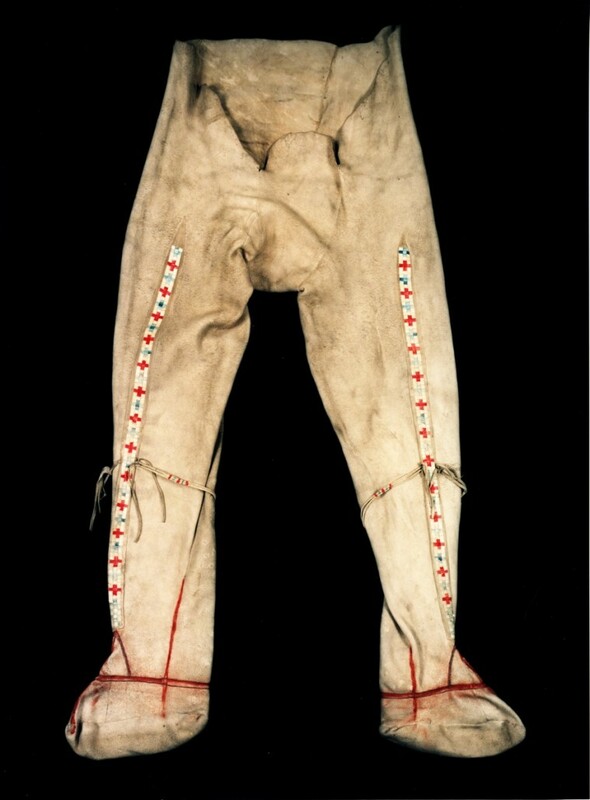 Tanned moose skin, lined with cotton print fabric and decorated with red and blue wool cloth, blue silk ribbon, green and white glass beads, blue and red wool tassels, and a fringe of skin thongs. Dimensions: 360 x 140 mm. Given by the Rev. W.W Kirkby, Fort Simpson, 1862. 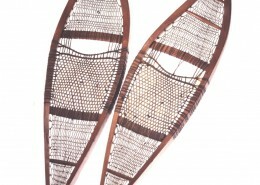 Netted babiche with tanned caribou skin side sections and upper edge. 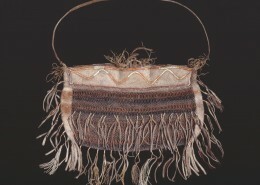 Decorated with horizontal bands of red and blue pigment and skin thongs wrapped with white and yellow porcupine quills. Top faced with red wool cloth, (and probably formerly some blue wool cloth). Babiche loops at edge for attaching a carrying strap. Dimensions: 565 x 280 mm. 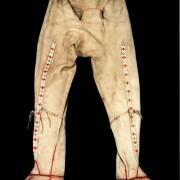 Caribou leg-skins sewn with sinew. 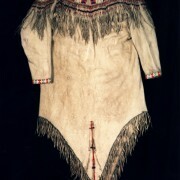 Top of tanned caribou skin with a thong drawstring tie. Dimensions: 450 x 335 mm. 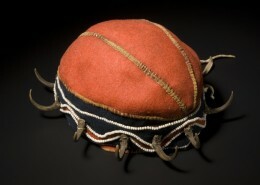 Netted babiche with tanned caribou skin side sections and upper edge. 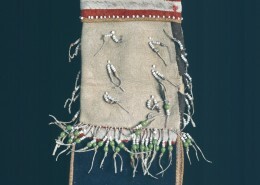 Decorated with horizontal bands of red and blue pigment, skin thongs wrapped with yellow and white quills, red and blue wool tassels, and tassels of yellow sewing silk. The upper edge is worked with yellow and white goose quills, and pink and orange porcupine quills. Thong carrying strap. Sewn with sinew. Dimensions: 230 x 155 mm. At puberty, a young girl was secluded from the main camp. It was a period of mentoring and learning from other women. She also had to observe various food and behavioral taboos. In some regions, water could not touch her lips so she drank through a tube. 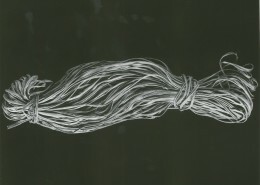 In this case, a swan wing bone decorated with a wrapping of braided porcupine quills was used. 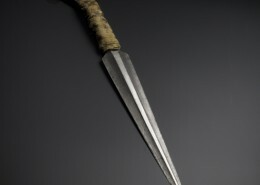 Most likely a Russian trade item that found its way east from Alaska, this iron knife, with its forked and spiraled hilt, has the handle wrapped with hide. These knives often appear in drawings and the occasional photograph from this period. Often called “carioles”, these toboggans were introduced to the north during the fur trade and were used to move freight and passengers. Before the fur trade, dogs were not as common and toboggans were narrow and flat and were pulled by people. 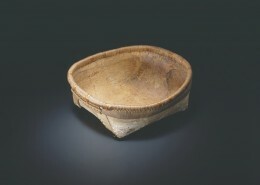 This cariole model is made of birch and skin parchment. 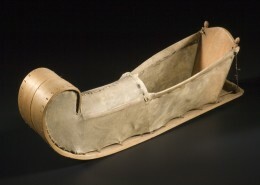 The dog harness, made from a padded caribou skin collar with two hide strips, connected the dogs to the sled lines. 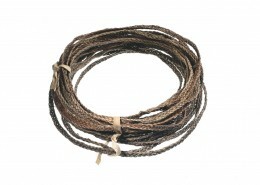 Narrow bands of babiche could be braided together to make strong ropes. 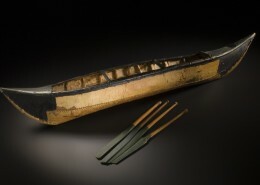 Birchbark canoes were an effective means of transportation because they were durable, seaworthy, and light. They were ideal for traveling great distances on northern lakes and rivers. When damaged, repair material was readily available in the surrounding forests. 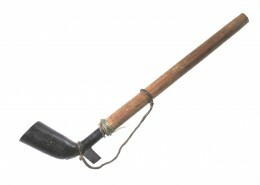 This style of canoe was usually used for hunting and was seldom longer than four meters. Their smaller size made them easy to portage. 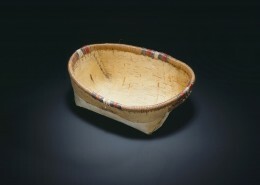 The birchbark canoe combined a large carrying capacity with minimum weight. Bark for construction was removed from the trees in spring. Twenty to twenty five sheets of bark were needed to cover the spruce frame. The seams were sewn with split spruce roots and sealed with spruce gum. 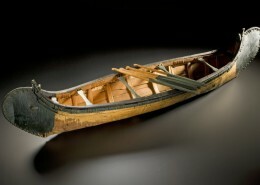 Canoes of this style up to 5 meters long were used for moving freight and people. 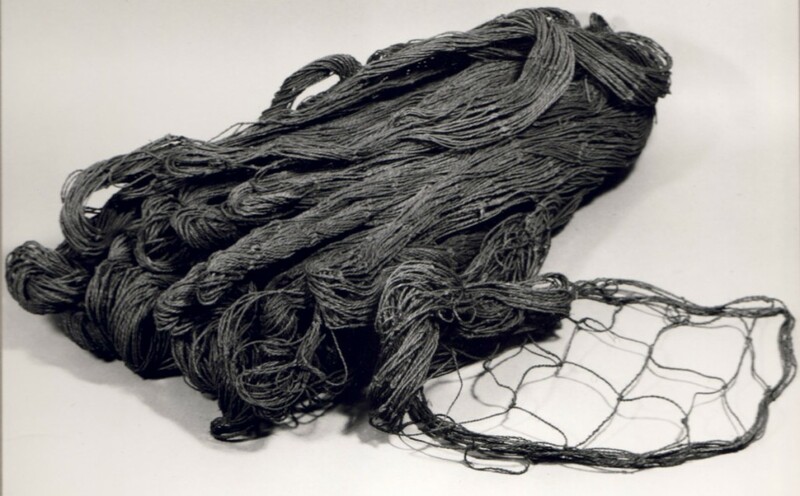 Fishing nets were an essential tool for providing food for both people and dogs. Nets like this were carefully constructed from the inner bark of willow trees. Although generally made by women, a whole family could be involved in the net building process. Unlike babiche or sinew, willow did not stretch or become slippery when it was wet. Black stone bowl, carved in the style of a European clay pipe, attached to the wooden stem by a skin thong. Dimensions: 210 x 64 mm. 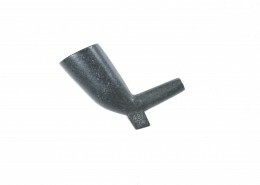 Stone, carved in the style of a European clay pipe. Dimensions: 55 x 49 mm. Dimensions: 53 x 50 mm. 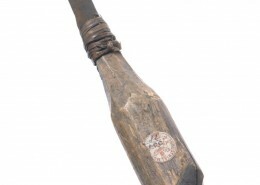 Provenance: Obtained from the Dogrib Indians, Fort Rae, Great Slave Lake. Single-edged iron blade with an upturned end; probably made from a discarded European file. Dimensions: 200 x 15 mm. 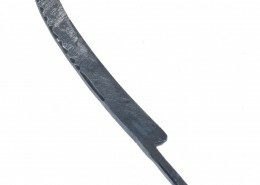 Pointed and twisted iron blade inserted into a wooden handle and bound with spruce root. Dimensions: 140 x 29 mm. Made from the inner bark, or bast, of the willow. Dimensions: 5100 x 895 mm. 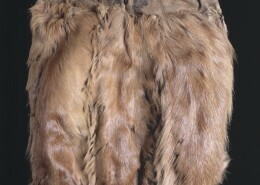 Three sets of harness, each consisting of a padded collar of tanned caribou skin with two traces of skin for fastening the dog to the sled, joined by a piece across the back. Dimensions: 1375 x 205 mm. Two bundles of six-ply plaited babiche. Dimensions: 6200 x 7 mm. ; 8940 x 8 mm. (A). Wood frames laced with babiche, with pointed ends, upturned at the front. Dimensions: 590 x 147 mm.